For beauty, timeless style, and an easy-to-clean option, window shutters are the way to go! 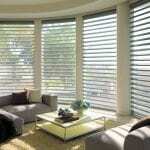 Here at Ashtons Blinds, you certainly can have your pick of window treatments for your Owen Sound, Ontario property! With many different types of blinds, curtains, shades, custom window treatments, and shutters, you can have perfectly suited window treatment options for every room of your home or commercial building. All of these options have their place, but we would like to take a minute to discuss the many benefits of a great choice for any home or office — window shutters. Window shutters are great for long-term style goals. Because window shutters are a classic, timeless look, you can feel confident about having them installed. While you might regret the bold colour you painted the walls or the light fixtures you chose, window shutters will never go out of style. With proper care, window shutters can outlast many other window treatments as well. All they need is a quick swipe with a damp cleaning cloth to rid them of dust or debris and to keep them looking like new. In addition to looking fantastic, window shutters are great for privacy as well. They can be easily shut to block out excess light or to make your space feel more intimate. Because our window shutters are made of high-quality materials, they can block not just light, but damaging UV rays and sound as well. At Ashtons Blinds, we love all the differing types of window treatments available to you, including window shutters! If you’d like to see how window shutters or other options would look in your own windows, call today and schedule an appointment for an in-house consultation. We look forward to working with you. At Ashtons Blinds, we offer window shutters to residents of Thornbury, Collingwood, Meaford, Owen Sound, Craigleith, and The Blue Mountains, Ontario.